and show your ability to read and key this speed perfectly. VHSC-Members may give a recommendation to you for VHSC-Membership. Do NOT fish for a recommendation at the beginning of a QSO. of 200 letters per minute or higher. (Paris-base, 40 wpm). Solid copy should be made by the applicant, together with excellent keying. No keyboards or decoders are allowed during these contacts. A recommendation is valid for a maximum of 3 years. our News-sheet, which is sent to all VHSC-Members. VHSC-Candidate can be registrated as a VHSC-Member. 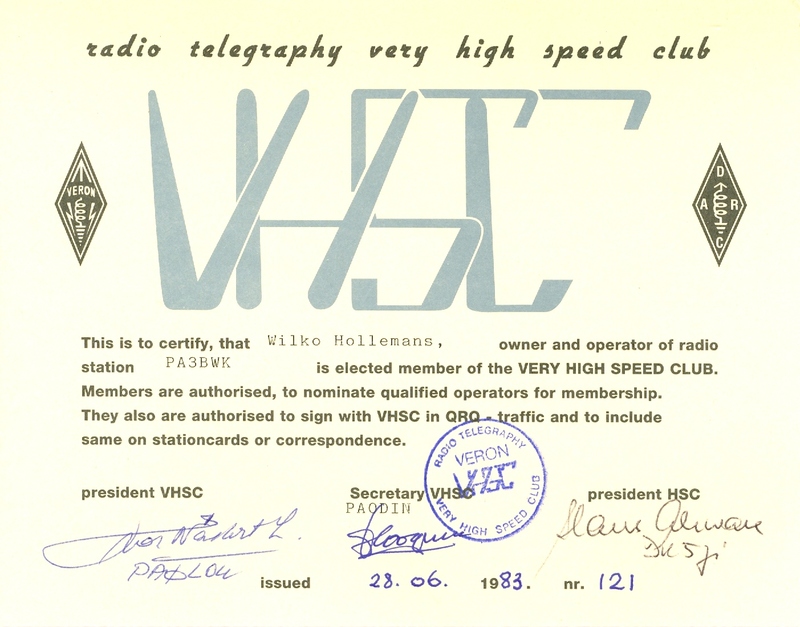 and must mention the CW-speed used during that VHSC-test-QSO. keyboard or decoder during the 4 test-QSO's. A certificate of membership is sent to members. There is no further payment for membership.